Hello all! 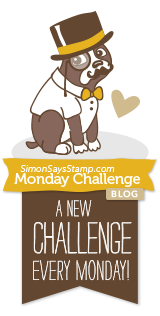 Monday again, and time for another project in my month in the Designer Spotlight at the Simon Says Stamp Monday Challenge. We're playing with Patterned Paper this week. Like many crafters, I have a large stash of beautiful papers - much-loved, often-stroked and sighed over, but seldom used in my crafting. Last week's Travel Journal was the exception rather than the rule. But it's great to be nudged into using them so I got out my Tim Holtz Wallflower Paper Stash - one of my absolute favourites - and created this mini-album. You've seen variations on this construction here at Words and Pictures before (you may remember The Business of Men). All those lovely pocket pages are less glamorous than they might appear... the basic structure is made out of empty toilet rolls. I did have a "before" of them all squashed flat and ready to be covered but it seems to have disappeared so you're just going to have to believe me! And I'm sorry but you'll need your cups of coffee/glasses of wine at the ready for another photo-heavy journey I'm afraid. I had to create the binding and covers for my toilet roll pages, and I did that using strong kraft card folded to hold the pages with another piece of the same card folded around that as the base of the covers. I then cut some really sturdy card for the front and back and glued it all together to give the album some real strength and heft. ... and the other. These papers are from the brilliant pages at the back of the stash where there are ATC-sized pieces ready to go. Since the inserts are pretty much exactly ATC-sized, that made life pretty simple! Since I wanted each open page spread to have some continuity I had to pay attention to my fronts and backs. And the inner covers needed to match the respective first and last pages. But let's not get ahead of ourselves. First, I'll show you the cover, and then we'll make our way through the album. The cover has one of Tim Holtz's Idea-ology Timepieces, altered with Pitch Black alcohol ink and Treasure Gold in Florentine. I also added one of my much-loved WordBands and a vintage pen nib over some sticky-backed linen ribbon (I think the new Textile Surfaces would probably be very similar), which I think has the right sort of elegance to go with this beautiful paper. That linen ribbon goes all the way around to the back. It's all one piece of paper, it's just that the design on that particular page changes around here which I rather love. So let us meet the first of our women, chosen for their "off-camera" looks - not a direct gaze, but each looking at or towards something out of our sight. You can probably guess how much the continuity from the inside front cover pleases me here! The dreamy look in her eye seemed to fit the words. The collages are essentially very simple - there's the Photobooth photo, a punched butterfly or two, a couple of paper snippets, and various love letters, postcards or envelopes cut from the incredibly useful Idea-ology Pocket Cards. Next page has the butterfly motif in the backing paper, and a slightly different atmosphere though the collaging follows the same pattern. And since we now have a double page spread, there's a small echoing collage on the opposite side. There's a slightly forced quality to this woman's smile, I think. Those teeth look slightly gritted... perhaps with determination to keep moving forward, or perhaps she just shares my wariness of photographs being taken. The next page is warmer and more colourful, with an optimistic young woman looking forward to whatever is ahead. Oh, each collage has a couple of metal elements too... I forgot about those in the list above. There's the odd Philosophy Tag or Muse Token, some skeleton leaves. Most of the metal was in the Antique Brass finish, the golden toned one, but I added some Florentine Treasure Gold for an extra warm glow. I love this woman with the gentle gaze in her eye and the determined look to her lips! The papers here were in very delicate neutral tones, but you'll see I did a bit of Peeled Paint Distress Stain shading around the elements. I think it helps draw the eye in, and it also ties the pages together. She's clearly been receiving a lot of love letters lately, and I think she's definitely ready to follow her heart. I'm particularly fond of the woman on the final page - there's a light in her eyes which makes me think she'd be fun to have a conversation with. She's got a keyhole from the Locket Keys set as her metal element, and a Purchaser's Receipt tucked away - what's she keeping hidden? Here she is with the inside back cover opened out, also with a bit of Peeled Paint added to make it tone in better. Another thing I forgot... each page has a strip of "lace", cut with the Lace Thinlits dies out of other papers from the Wallflower stash. Oh, except one of them is cut with the Vintage Lace Decorative Strip Die. The snippet had been sitting around on my craft table for months so I thought it was time it was pressed into service. The words for each woman are Small Talk stickers, of course... strong affirmations to go with these strong women. Can you tell I'm not up to my usual post-writing self? . Sorry I keep forgetting things, and I'm sorry if it's not as coherent as usual... there's just too much going on at the moment! All the page and insert edges are inked with Frayed Burlap - a colour which tones with these papers just perfectly. It's only on this one that I made a conscious effort to get the pink tab inside the pinkish-toned page. It's a happy accident that we discover what (or should I say who) might have put the smile on the face of our final woman! The File Tabs on each of the inserts come in a nickel silver finish originally, so I spent some time with PaperArtsy Fresco Finish Paints in Old Gold, White Fire and Little Black Dress to change them to a more brass/gold look. The final touch was to add some Florentine Treasure Gold, helping them tone in with the other metal accents in the album. So I think I've covered everything... though given how much I forgot on the way, there's bound to be something I've left out. I know they're very long posts at the moment, but since it's only one a week, I'm hoping you'll forgive me. I hope my Patterned Paper mini-album will inspire you to come along and play this week at the Simon Says Stamp Monday Challenge. If you're in need of more inspiration just check out the amazing projects from the Design Team, and the usual generous prize voucher from Simon Says Stamp should add the final nudge if you're still reluctant to break into that paper stash! Thanks so much for stopping by today. Believe it or not, I'm back in NYC this week, so I'll try to do some visiting in between workshops. Hope to see you soon! Maybe she was a wallflower. There was no shame in that. Especially if one enjoyed being a wallflower. Alison, it is a fabulous little album. So beautiful is every page, and I love the way you made the attachment for the spines! Every page is a story on its own, and so lovely colored. The papers you used very ,very yummy, and oh the cover ,just ,-amazing all. This is one of my favorite paper packs too, Alison!What a lovely mini and as always a pleasure to read the post till the end! Great images, colours and textures Alison. Wow, Alison, this mini album is amazing! Each page is a treat for the eyes with so much detail. Absolutely beautiful!! Beautiful!! so much work has gone into this album. I am impressed with the neat folding for the binder, I'd get in a right pickle! gosh, your mini album is outstanding Alison..every page and every detail is gorgeous.The women do talk with their eyes and smiles and the papers are fabulous..brilliant project. What a BEAUTIFUL album! So much love ... LOVE it! A lovely creation that is so very tough! Ok, so you jumped about a bit with the info but...hey just goes to show we are all human lol! A stunning mini album Alison, the details on each page are awesome. I know what you mean about hoarding papers. Oh wow! A lovely mini wallflower album! This is stunning Alison with a great idea to add the pages. It all looks so slid and lasting. This looks gorgeous. I wish I could hold it en see it in real. You made alot of work and it is so pretty!!! Toilet paper rolls? Seriously? Holy cow! If I were a toilet paper roll, I can imagine no greater honor than to be transformed into a piece of art like this! I love how you kept the same tones and palette throughout, yet each section is so unique and detail-worthy! Really stunning work, which doesn't surprise me in the least! What a lovely little album! It looks so beautiful photographed in among the real leaves. It seems at home there due to all the aging you have done. Gorgeous! Amazing little book. The whole book is beautiful and I love the stories you tell for each page. 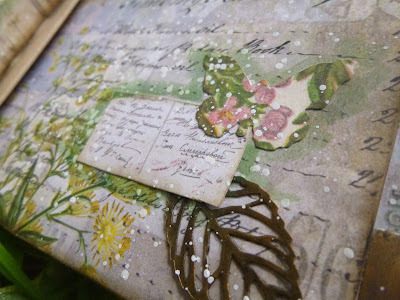 I have some of that Tim Holtz Wallflower paper but have not yet taken the plunge and used it, it is just so gorgeous isn't it. What a clever way to upcycle, Alison! I love it! This is an amazing little album, each page having it's own story to tell with all the lovely details you've added. Love the masculine twist of the'happy accident'. Great recycling too. What a gorgeous mini album, Alison! Love all wonderful details on it. The images, textures and combination of colours are fabulous. A great job!!! A beautiful album and so delightfully adorned - ingenious to base it around toilet roll inners - I would never have guessed. I love the Wallflower papers, and just like you said I have them in amongst my stash of beautiful papers - and yes I do stroke them and sigh over them, and I also sometimes feel they are too beautiful to use! I really must do something with them now I've seen your stunning work. Alison, in spite of what you say about being distracted by so much going on, your post is delightful, both in words and pictures! I loved reading about the feminine characters you've created out of the Photobooth's and too, about how this wonderful album came together from such humble beginnings! I was just leafing through my Tim papers the other day, and by far my favorite is this Wallflower stash. You have put it to amazing use here, and each page blends so well with the next. Your collages are stunning and inspiring! I could gush about this all day, but I'll just have to say the linen strip of ribbon is what tops it out for me! Love this in it's entirety! thank you so much for sharing this with us! Hugs! Another awesome journal Alison, so well done and beautiful pages insides, I continue to be in awe in front of each and every project, always so stunning!!! 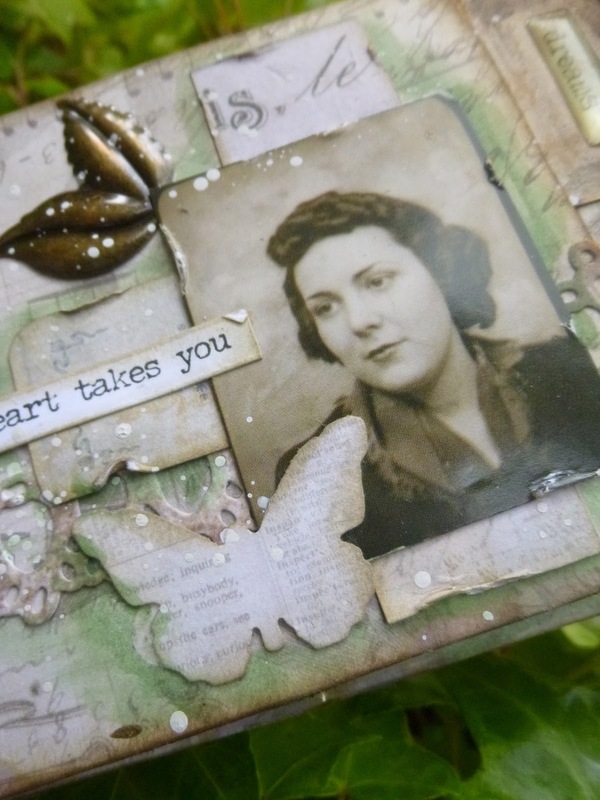 I love your style in all the mixed media pages!Simply Gorgeous work! Alison, I really love your little album, it´s amazing! Every page is so wonderful created and the little details are beautiful. Although you did them pretty similar, every page is unique. I rewatched your elder albums and they are so gorgeous too. I need to try doing one too! Don't know how I managed to miss this one, - what a super little album and fantastic use of those papers, - just beautifully put together! Wonderful and would really be a family keepsake if one could use all vintage family photos. *sigh* another gorgeous little booklet. I adore those metal tabs on the page inserts. Of course your choice of colors and ephemera are spot on as always. It's so wonderful! So very beautiful with all those details in line- you are so genius at marrying elements,pagers,papers and colors!! Well, did I say lately what a fan I am?